POND, PETER, army officer, fur trader, explorer, map maker, and writer; b. 18 Jan. 1739/40 in Milford, Conn., eldest son of Peter Pond and Mary Hubbard; m. Susanna Newell, probably in 1762, and they had at least two children; d. 1807 in Milford. This remarkable, eccentric, and violent man was born, according to his own account, into a family well known for five generations as “all waryers [warriors] Ither by Sea or Land.” Despite objections from his parents, in April 1756 he enlisted as a private in the seventh company of the 1st Connecticut Regiment under Captain David Baldwin. In June the company sailed from Milford to New York harbour and then up the Hudson River to the Half Moon (north of Albany), where the regiment gathered for a descent on the French at Fort Carillon (near Ticonderoga, N.Y.). Winter intervened, the regiment was dispersed, and Pond returned to his parents. 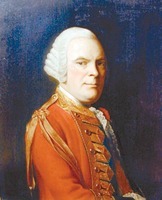 In 1758 an army was required for James Abercromby*’s assault on Carillon; Pond rejoined the Connecticut troops and took part in the operation. On 17 April 1759 he again enlisted, this time as a sergeant, giving his occupation as shoemaker. He joined the Suffolk County Regiment at Long Island, N.Y., for an army raised “to go a ganst Niagaray [Fort Niagara, near Youngstown, N.Y.]” under John Prideaux. At Oswego, Colonel John Johnstone of the New York Regiment singled out Pond to be with him in the journey to the Niagara region. 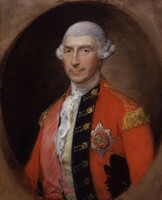 After serving until exhaustion as orderly sergeant to Prideaux, Pond was with Sir William Johnson*, who commanded the army after Prideaux’s death, at the capture of the fort. “I Got But One Slite wound Dureing the Seage,” he recalled. From Niagara, Pond returned with his regiment to Oswego and helped build a camp there in preparation for an assault on Montreal. After passing the winter of 1759–60 at Milford, where a number of French prisoners were billeted, in 1760 he received an officer’s commission and for the fourth time entered the army. 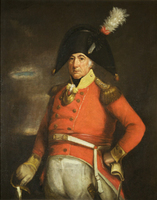 He went first to Albany, and then to Oswego to join Amherst*’s forces which were assembled for the taking of Montreal, the sole remaining French stronghold. 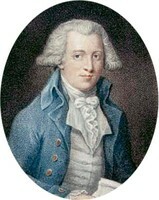 He was present at the town’s surrender on 8 Sept. 1760. After the conquest Pond “thought thane was no bisnes left for me” in Canada. In 1761 he therefore turned his attention to seafaring, with the intention of making it a profession. He sailed to the West Indies, presumably from a New England port. On his return to Milford he found his father had gone to Detroit (Mich.) on a trading voyage and his mother had died of a fever. Pond gave up seafaring, took charge of the numerous young family, and stayed in Milford for three years. It was, he later wrote, the longest time between the ages of 16 and 60 that he stayed in one place. Having decided to enter the fur trade in the Detroit region, Pond left Milford, likely in 1765, and for six years carried on business in the west. In this period, having been abused and threatened by another trader, he killed his opponent in a duel, returned from Detroit, and proclaimed the event to authorities but was not prosecuted. Documents show that in 1771 he was in partnership with Felix Graham, a merchant trading from New York to Michilimackinac (Mackinaw City, Mich.). He made another voyage to the West Indies, apparently in 1772. On his return he accepted an invitation to renew his partnership with Graham. In 1773 Graham took a large cargo from New York to Michilimackinac by way of the Great Lakes. Pond, who “wanted Sum Small artikels in the Indan way to Cumpleat my asortment,” went up to Montreal. He arranged with Isaac Todd and James McGill to have these items shipped in their canoes and set out with them by the Ottawa River route for Michilimackinac. At that post he bought canoes and supplies, engaged men, and loaded bales. Altogether he had 12 canoes, “my small fleat,” and 4,600 pounds of goods valued at more than £1,200. In September 1773 he crossed Lake Michigan to Green Bay. He visited the Menominees on the north side of the bay, the Winnebagos on “Peuans Lake” (Lake Winnebago, Wis.), and may have traded with the Foxes. He ascended the Fox River to a place where that tribe interred its dead and then portaged to the Wisconsin River, “a Gentel Glideing Stream” and part of the Mississippi drainage system. Near the end of September he arrived at the Sauk village on the north side of the Wisconsin. In his narrative he recorded cultural traits of that tribe: “Thay are . . . Les Inclined to tricks and Bad mannars then thane Nighbers . . . Sum of thane Huts are Sixtey feet Long and Contanes Saverl fammalyes . . . the women Rase Grat Crop of Corn Been Pumkens – Potatoes Millans . . . Thay are Not Verey Gellas of thare women.” He then descended the river some 50 miles to a village of Foxes, “a Differant Sort of People Who was Bread at Detroit under the french Government and Clarge; till thay By Chrisanissing Grew so Bad thay [the French] ware Oblige to Go to war a Ganst them,” and who now lived in “Sad Sarkamstanis.” They had recently been infected by an epidemic, and Pond remained only one day, managing to do a little trading before continuing downstream to the Mississippi. There, at Prairie du Chien, he found many French traders, and Indians purchasing supplies for the winter hunt. He stayed ten days, while he dispatched nine clerks to various tributaries of the Wisconsin and Mississippi for trade. In October 1773 he left for the St Peters River (Minnesota River, Minn.) with two other traders. On the river about 14 miles from its mouth, he found a log house which he supposed to be that of Jonathan Carver, where the explorer had wintered in 1766–67. Pond later wrote that he thought little of Carver and could have completed his whole tour in six weeks. Pond passed the winter of 1773–74 on the high banks of the St Peters River and conducted business with the Indians in gentle competition with a French trader. When the ice broke and the water level receded, Pond’s party descended the river to Prairie du Chien. He collected pelts from various tribes gathered there, against keen trade from New Orleans, the Illinois, and Michilimackinac. “All my Outfits had Dun well,” he wrote, “I had a grate Share for my Part a[s] I furnish Much the Largest Cargo on the River.” This statement suggests that Pond was relying heavily on bulk imports and that he had a good source of supply. In July 1774 he was back at Michilimackinac where he found his partner Graham with a large cargo. Pond had done so well that he proposed to buy Graham out. He paid him for the 1773 cargo “and well on toward the One he had Brot me.” Pond’s first venture had ended. He had learned the trade, mastered the art of getting along with fellow traders and at the same time out-trading them when necessary, become familiar with wilderness travel and survival, and emerged a successful capitalist. He entered into partnership with another merchant, Thomas Williams, an arrangement that would last until 1777. Trade from Michilimackinac to the Mississippi was severely threatened when war between the Ojibwas and Sioux broke out again. A Lake Superior trader brought news of the fighting to the fort about the first of August 1774. The commandant, Arent Schuyler DePeyster*, gathered Pond and the other traders together, had six large wampum belts made (three for each nation), and sent Pond to the Sioux and other agents to the Ojibwas. Chiefs of the opposing sides were to assemble at Michilimackinac in the spring of 1775 for a council. Pond went to Prairie du Chien and found the Sioux there not involved in the fighting. He took the occasion to go up the St Peters River to trade with a band of Yankton Sioux who had never met whites and of whose customs he left an important ethnological account. After wintering at his post on the St Peters, he assembled 11 Sioux chiefs and explained the wampum belts; he then headed for Michilimackinac with them. The group was joined at Prairie du Chien by Indians of various tribes who were waiting there. At Michilimackinac, DePeyster chaired a grand council which was followed by a decade of peace between the warring parties [see Joseph-Louis Ainsse]. After this venture Pond never returned to the upper Mississippi, deciding instead to pursue trade in the northwest via Grand Portage (near Grand Portage, Minn.). He was at the time a partner in the firm of Pond and Graves, which seems to have been a subsidiary of Pond and Williams. Traders from Montreal and from the Hudson’s Bay Company had recently begun moving into the Saskatchewan valley seeking better quality pelts. Doubtless knowing of these prospects, Pond joined Alexander Henry* on 18 Aug. 1775 near the Cree village at the mouth of the Winnipeg River. Three weeks later they were overtaken by Joseph and Thomas Frobisher and Charles Paterson; the whole party, consisting of 30 canoes and 130 men, reached the mouth of the Saskatchewan on 1 October. They ascended the river to the HBC’s Cumberland House (Sask. ), where they were greeted with civility but as unwanted guests by Matthew Cocking*. The canoes separated, and Pond went south through Little Lake Winnipeg (Lake Winnipegosis, Man.) and travelled up Mossy River to winter at his Fort Dauphin, which he locates on the northwest corner of Dauphin Lake itself. Unless an agreement to cooperate had been undertaken, Pond would have been in opposition to John Cole* at Peter Pangman’s Fort Dauphin. (Pond was not trading with the “common concern” of Henry, Pangman, Paterson, Jean-Baptiste Cadot, and James Finlay.) At Dauphin Lake there was plenty of buffalo meat available, and he was in a position to intercept Indians bound for Cumberland House. In 1776 Pond went to Michilimackinac and arranged to have the next season’s goods brought to Grand Portage. He had realized the necessity of keeping his supply base as far forward as possible. In so doing he assisted the process whereby Grand Portage, and later Fort William (Thunder Bay, Ont. ), supplanted Michilimackinac as the western supply depot of the northwest fur trade. He evidently wintered for the next two years, 1776–77 and 1777–78, at the junction of the Sturgeon River (Sask.) and the North Saskatchewan, a short distance downriver from the place where HBC employee Robert Longmoor would soon challenge the pedlars’ hold on trade. 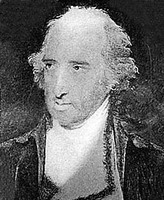 Apparently on 17 April 1777, Pond had entered partnership with trader George McBeath, who was also associated with Simon McTavish. It was McBeath who looked after the Montreal to Grand Portage section of the enterprise with Pond. Pond wintered on the Athabasca River, about 40 miles from the lake, in 1778–79. There he saw a “vast concourse” of Crees and Chipewyans, who went down each year to Prince of Wales’s Fort (Churchill, Man.) via lengthy, difficult routes. According to Alexander Mackenzie, who was in the Athabasca country himself a decade after, these tribes were pleased to see traders who would “relieve them from such long, toilsome, and dangerous journies; and were immediately reconciled to give an advanced price for the articles necessary to their comfort and convenience.” Pond was thus able to obtain more furs than his canoes could carry. Accordingly he stockpiled the remainder in winter huts. In the spring of 1779 Pond came heavily laden out of Athabasca at the completion of what was in effect a trading expedition of two summers’ duration. 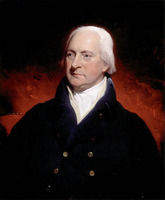 On 2 July he arrived at Cumberland House “with three Canoes from the Northward very much distressed for want of food having bad Success on his Journey down his Canoes being broke upon the fall’s.” From the master, William Walker*, who treated him civilly for previous kindnesses, he acquired tobacco, powder, and meat. 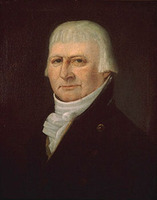 Pond told Walker that he had gone far enough north to trade with “the Northward Indians” among whom Samuel Hearne* had been with Matonabbee*. During trading, he said, he had made 140 packs of 90 pounds each but had been obliged to leave most of them behind. Since one pack contained about 60 pelts, the whole would have constituted some 8,400 made beaver. Historian Edwin Ernest Rich states that in 1779 Pond brought out more than 80,000 fine beaver skins. This would have been about 60 tons of furs – an extraordinary load for three canoes, given that the average canot du nord had a carrying capacity of a ton and a half. Pond told Walker freely of his discoveries and informed him of Portage La Loche. About 12 miles in length and so steep that it had taken the party eight days to complete it, this portage ran between Lac La Loche, in the Hudson Bay watershed, and the Pelican (Clearwater) River, in the Athabasca drainage. Pond continued east to Grand Portage, and returned to Athabasca directly to bring out the furs he had left behind. The licence issued to him in Montreal in 1780 for four canoes to be sent up to Grand Portage must therefore have been given in his absence. He spent the winter of 1780–81 at Michilimackinac, arriving on 26 November with seven engagés in a bateau from Lake Superior and remaining at least until 10 May. He entered a partnership with McBeath and Booty Graves and returned west to winter in 1781–82 with Jean-Étienne Waddens* at Lac la Ronge (Sask.). The two men represented different and yet interrelated trading interests. Pond’s was the larger and was built around the more sizeable Montreal houses, such as those of the Frobishers and Simon McTavish; Waddens was acting for an association of smaller houses, such as those of Forrest Oakes* and John Ross. The two groups were in some way affiliated, and in 1779 it had been intended that Waddens should replace Pond in trading with the Indians of Athabasca. However, rivalry between the two sets of interests was not resolved, and in a compromise arrangement the men were to trade side by side at Lac la Ronge in 1781–82. They were reported to be of distinctly different character, and ill will developed between them doubtless also because of economic competition. In February they fought, but details are not known. At the beginning of March Waddens was shot and mortally wounded, perhaps by Pond or his clerk. Waddens’s widow pressed charges but historians disagree as to whether or not Pond stood trial. Relying, no doubt, on a remark by Alexander Mackenzie, Innis claims that “it may be assumed” Pond was tried and acquitted in Montreal during the winter of 1784–85. The only documentation located, however, is a deposition by Waddens’s clerk, and Arthur Silver Morton* maintains that the absence of any record of a trial indicates Pond was merely examined; he suggests that the case was not taken to court because the murder had occurred in a region beyond the jurisdiction of Quebec’s legal system. Pond wintered on Lac Île-à-la-Crosse in 1782–83 and then proceeded to Athabasca, probably in the spring. The years between 1776 and 1783 had seen a growing tendency of fur-trade interests to coalesce and a series of agreements, usually annual, eventually produced the first declared North West Company, formed in 1783–84 and intended to last for five years. Pond seems to have had one of the 16 shares in the 1779 company, and in his absence he was allotted one share in the 1783–84 organization. Pond probably explored waters downriver of Lake Athabasca, but how far is not known. He learned from Indians the approximate location of Great Slave and Great Bear lakes and perhaps of the Peace and Mackenzie rivers. Especially in 1783–84 he came into contact with many Indians from the country north of Lake Athabasca, and he secured for the Nor’Westers a trade that the HBC was unable to divert. In 1784 Pond came out to Grand Portage and to Montreal, where in February 1785 he became a charter member of the Beaver Club. During the winter of 1784–85 Pond drew his celebrated map, showing the rivers and lakes from the Great Lakes and Hudson Bay westward to the Rocky Mountains and northward to the Arctic. It indicates a large river flowing from Lake Athabasca to Slave (Great Slave) Lake and thence to the Arctic Ocean, called by Pond “Supposed, the Ice Sea.” One copy of the map was prepared for submission to the United States Congress. In April 1785 another was given to the lieutenant governor of Quebec, Henry Hamilton*, as was a memorial signed by Pond and probably written by the Frobishers which asked Hamilton to support a scheme for discoveries of the northwestern reaches of North America under Pond’s leadership. 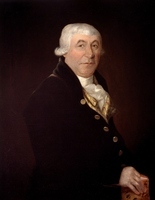 Anxious to assist Pond and prevent him from aiding the United States or another country, Hamilton urged the British government, but unsuccessfully, to help him and the Nor’Westers. In the spring of 1788 Pond left the northwest never to return. From the time of the murder of Waddens in 1782 he had been a marked man, and his time in the west limited. This situation was re-emphasized with Ross’s murder five years later, despite Pond’s apparent remoteness from the episode. The second death led to his withdrawal or forced retirement from the fur trade. 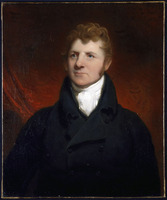 Alexander Mackenzie profited from Pond’s pioneering enterprises and geographical ideas, building a career and reputation on business activities suggested by Pond’s theories and activities. Pond continued to produce maps of the northwest. 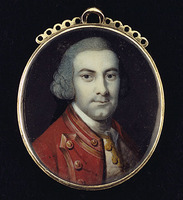 One, dated 6 Dec. 1787, he presented to Lord Dorchester [Guy Carleton] at Quebec. Dorchester sent it to London in November 1790, but a simplified copy had already been published in the Gentleman’s Magazine of March 1790. Pond made yet another version, intended for the empress of Russia. These maps show that he had become aware of Captain James Cook*’s discoveries. What is now called Cook Inlet, Alaska, was thought by the captain to be a river flowing from the east, and Pond’s 1787 maps strongly suggest that it drains from a gigantic Great Slave Lake. In 1789 Alexander Mackenzie explored the river leading out of that lake and found it flowed to the Arctic, as Pond’s first maps had indicated. Pond’s willingness to change on the basis of Cook’s unsubstantiated discovery dramatically hurt his credibility as a map maker, but he was not alone in making the error. Pond was not included in the 1790 reorganization of the NWC, having sold his share that year to William McGillivray* for £800. 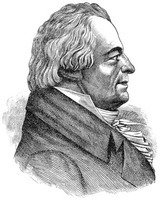 Dorchester had knowledge that Pond quit the province of Quebec owing to his dissatisfaction with the NWC. His intention, Dorchester said, was to seek employment in his native United States. That same year Pond visited President Ezra Stiles of Yale College, who made a copy of his map. In November 1791 he was offered an unspecified share in a projected “Company for the N.W.” in opposition to the NWC by John Howard, Jacob Jordan*, and Samuel Birnie, to be supported by Jordan’s backers, Brickwood, Pattle and Company of London. Pond’s response to this proposal is not known. On 9 Jan. 1792 “Captain” Peter Pond and William Steedman were instructed by the American secretary of War to go to Niagara and Detroit to seek from warring Indians a request for peace [see Michikinakoua]. Whether Pond went has not been discovered. The latter years of his life were spent in the United States, most probably at Milford, and he passed the time reading the travels of the Baron de Lahontan [Louis-Armand de Lom* d’Arce] and Jonathan Carver. He died impoverished in 1807. Peter Pond National Historic Site, at the junction of the Sturgeon River and the North Saskatchewan, and Peter Pond Lake (Sask.) have been named after him. Pond was an unusual man, more energetic, more aggressive, and more capable of organizing than most traders. Lured by profits from northern furs, he pushed farther north and west than any other trader in the 1770s and 1780s. He was the first white man to cross Portage La Loche (also known as Methye Portage) to the Athabasca River and Lake Athabasca. The discovery linked the Mackenzie watershed with the rivers flowing to Hudson Bay. In this achievement Pond succeeded where others, especially Thomas Frobisher, had failed. The first white trader to push into the Athabasca country, he induced rivals in competition to his lucrative commerce, and his activities led to the first organization named the North West Company. They also opened what Mackenzie called the “new eldorado” of the NWC, around which the company’s prospects for the 1790s and afterwards revolved. 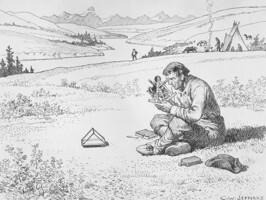 Pond’s use of supplies, including pemmican, and his good organization were keys to his success: they enabled him to travel farther and to trade better than his predecessors. They also set the pattern for NWC exploitation of the Athabasca country. His reputation for violence, however, invited the suspicion of other traders both inside and outside the concern and eventually forced his withdrawal from the company. Pond was the first to outline the general features of the Mackenzie River system. His findings fired Mackenzie with the possibilities of discovery in the north and led him to follow the course of the great river to its frozen mouth in 1789. Pond’s maps and suggested course of the waters of Athabasca are enduring testaments to him as a pioneer in the last great fur-bearing area of North America. [Pond’s narrative was probably written some time after he reached the age of 60. Many years later Sophia M. Mooney, the wife of Nathan Gillette Pond, discovered it in the home of former Connecticut governor Charles Hobby Pond. The account stops in 1775, and she reported that some pages had been torn off at the end. Whether or not much is missing is debatable. The manuscript is now in Yale Univ. Library, Beinecke Rare Book and ms Library (New Haven, Conn.); two photocopies are in the manuscript collection of the UTL-TF. A transcription by Mrs Pond, first published in the Conn. Magazine (New Haven), 10 (1906): 239–59, subsequently reappeared in Wis., State Hist. Soc., Coll., 18 (1908): 314–54, and in the first edition of Five fur traders of the northwest . . . , ed. Charles Marvin Gates ([Minneapolis, Minn.], 1933). A small part of the journal was published in the Journal of American Hist. (New Haven), 1 (1907): 357–65. To date the best text available is the new transcription prepared from the original manuscript at Yale by June D. Holmquist et al. for the second edition of Five fur traders of the northwest (St Paul, Minn., 1965). Buffalo and Erie County Hist. Soc. (Buffalo, N.Y.), C64-4 (Porteous papers), John Askin accounts, 1775. DPL, Burton Hist. Coll., Thomas Williams papers, Felix Graham and Peter Pond accounts, 1773–75. PAC, MG 11, [CO 42] Q, 24-2; 36-1: 280–310; MG 19, C1, 32A; MG 23, GIII, 8, 7 Jan. 1792; RG 4, B28, 115, 1780: 1; 1783: 1. PRO, CO 42/47: 649–51. UTL-TF, ms coll. 30. Yale Univ. Library, Beinecke Rare Book and ms Library (New Haven), Ezra Stiles papers, itinerary, 6: 406–7. [Joseph Banks], “Peter Pond and the overland route to Cook’s Inlet,” ed. R. H. Dillon, Pacific Northwest Quarterly (Seattle, Wash.), 42 (1951): 324–29. Les bourgeois de la Compagnie du Nord-Ouest (Masson). Cumberland House journals and inland journal, 1775–82, ed. E. E. Rich and A. M. Johnson (2v., London, 1951–52). Henry, Travels and adventures (Bain). Journals of Hearne and Turnor (Tyrrell). The journals of Jonathan Carver and related documents, 1766–1770, ed. John Parker ([St Paul], 1976). Mackenzie, Journals and letters (Lamb). “North-western explorations,” PAC Report, 1889: 29–38; 1890: 48–66. [Ezra Stiles], The literary diary of Ezra Stiles, D.D., LL.D, president of Yale College, ed. F. B. Dexter (3v., New York, 1901), 3: 383, 385–86, 388, 402. [David Thompson], David Thompson’s narrative of his explorations in western America, ed. J. B. Tyrrell (Toronto, 1916; repr. New York, 1968). DAB. D. A. Armour and K. R. Widder, At the crossroads: Michilimackinac during the American revolution (Mackinac Island, Mich., 1978). L. J. Burpee, The search for the western sea: the story of the exploration of north-western America (new ed., 2v., Toronto, 1935), 2: 325–53. Roy Daniells, Alexander Mackenzie and the north west (London, 1969). Davidson, NWC. 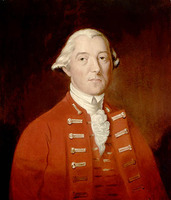 H. T. Fry, Alexander Dalrymple (1738–1808) and the expansion of British trade (Buffalo and Toronto, 1970). B. M. Gough, Distant dominion: Britain and the northwest coast of North America, 1597–1809 (Vancouver, 1980). Innis, Fur trade in Canada (1930); Peter Pond, fur trader and adventurer (Toronto, 1930). E. E. Rich, Montreal and the fur trade (Montreal, 1966). H. R. Wagner, Peter Pond, fur trader and explorer ([New Haven], 1955). W. S. Wallace, The pedlars from Quebec and other papers on the Nor’Westers (Toronto, 1954), 19–26. Glyndwr Williams, The British search for the northwest passage in the eighteenth century (London and Toronto, 1962). Douglas Brymner, “Report on Canadian archives,” PAC Report, 1889: xxxvi-xxxvii. CHR„ 13 (1932): 205–7. H. A. Innis, “The North West Company,” CHR, 8 (1927): 308–21; “Peter Pond and the influence of Capt. James Cook on exploration in the interior of North America,” RSC Trans., 3rd ser., 22 (1928), sect.ii: 131–41; “Peter Pond in 1780,” CHR, 9 (1928): 333; “Some further material on Peter Pond,” CHR, 16 (1935): 61–64. G. M. Lewis, “Changing national perspectives and the mapping of the Great Lakes between 1755 and 1795,” Cartographica ([Toronto]), 17 (1980), no.3: 1–31. 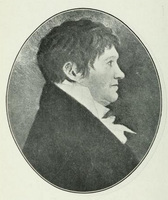 [R. W.] McLachlan, “Connecticut adventurer was a founder of famous fur trust in 1783,” Conn. Magazine (New Haven), 10 (1906): 236–37. Mrs N. G. Pond [S. M. Mooney], “Journal of ‘Sir’ Peter Pond . . . : introductory,” Conn. Magazine (New Haven), 10 (1906): 235–36. G. A. Young, “The organization of the transfer of furs at Fort William: a study in historical geography,” Thunder Bay Hist. Museum Soc., Papers and Records (Thunder Bay, Ont. ), 2 (1974): 29–36. Barry M. Gough, “POND, PETER,” in Dictionary of Canadian Biography, vol. 5, University of Toronto/Université Laval, 2003–, accessed April 24, 2019, http://www.biographi.ca/en/bio/pond_peter_5E.html.